This pretty, former chauffeur’s, cottage is set well away from the lane, situated between High Hurstwood and Buxted in an area designated of Outstanding Natural Beauty within the grounds of owners’ home overlooking fields and adjacent to an unfenced pond stocked with course fish which is home to a variety of local wildlife. Four steps lead up to the front door and on the ground floor the spacious accommodation consists of a hallway with a cosy living room leading off and an open fire, overlooking the pond and garden. A double bedroom with views of the garden and a family bathroom with overhead shower. There is a farmhouse style, well-equipped kitchen with separate dining area and a further single bedroom with basin. Both these rooms have excellent views over the pond. The first floor consists of a landing with hanging cupboard, a good sized single bedroom overlooking both the garden and pond and a large twin bedded (which can be made into a double bed) room with views of the gardens and an en-suite bathroom. Full oil central heating, kindling and coal for the fire, books and games, unlimited Wi-Fi access, TV, DVD player, dishwasher, washing machine, tumble dryer, freezer, cafetiere, microwave, charcoal BBQ, all towels and bed linen, a high chair, stair gate and cot (available on request) and a welcome pack with local seasonal fare. All children must be supervised in the garden with the unfenced pond. Course fishing is available on request. 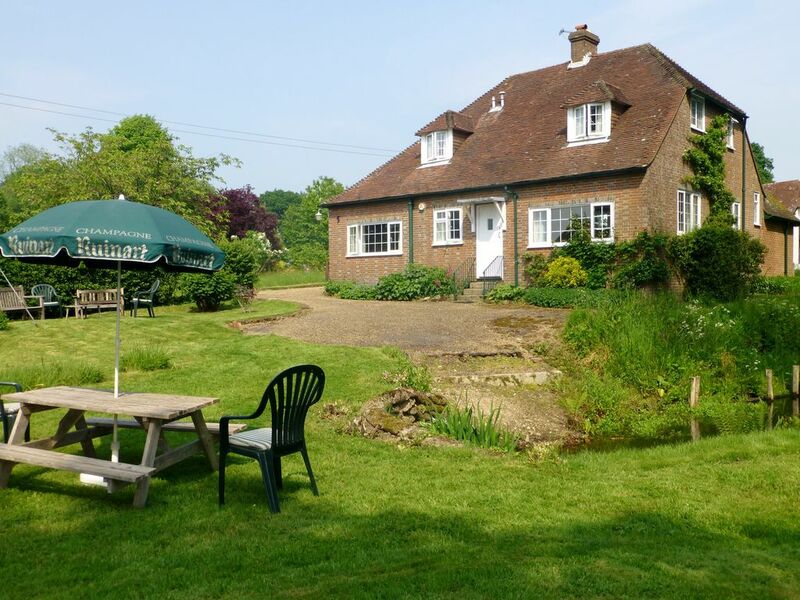 This property is situated in the heart of the AONB of the Sussex Weald which in Roman and Tudor times was the main iron producing region in Britain. The iron ore was used, amongst other things, to make canon ball to help fend off the Spanish Armada. We have a hammer pond dating back to this period and the remains of the bloomery and other workings of this industry can still be found nearby. An excellently presented property by owners who really care. It was big enough to easily accommodate three generations of the same family. Really lovely cottage in the middle of nowhere - 5 of us had a cozy new year break here. Great as a base for walking - the Vanguard Way passes close by. Even has a coal fire for those chilly evenings.
. Equiped with all we needed for a relaxing holiday. Comfortable accommodation in a quiet place, stay sitting by the lake or exploring the coast and countryside arround. Well equipped rural retreat with plenty of interior space. Outside is a rural pleasure. Wildlife galore with resident woodpecker to the fore. Nearby Crowborough has everything you will need. Owners live close by and are lovely neighbours. If you also need B and B, then Pat and John at Old Mill Farm are in the village - a wonderful treat. The Brennans were very welcoming, and provided a lovely retreat for us to stay, having had to repair and redecorate the cottages for us following a flood. It was a wonderful base for us to enjoy our stay in Sussex. .East Sussex National Golf Course, Glyndebourne Opera House, the Bluebell Railway, Drusilla’s Zoo Park and many other child friendly attractions are nearby. There are also many National Trust and notable properties such as Batemans the home of Kipling, Sissinghurst Castle, Leeds Castle, Bodium Castle, Charleston Farmhouse, Sheffield Park, Penshurst Place, Wakehurst Place , Nymans and many other gardens and notable properties are easily accessible . Also close is the spa town of Tunbridge Wells, the market town of Lewes, Ashdown Forest with Winnie the Pooh as well as the vast expanse of the South Downs with the South Down Way and its many picturesque villages nestling beneath. The area is ideal for walkers and there are riding establishments and other outdoor activities close by. The coastal towns and beaches of Brighton, Eastbourne and Hastings, with its historic Old Town, and the picturesque Cinq Port of Rye are all within easy driving distance. Cancellation Fees Should you need to cancel your booking for whatever reason the charges are as follows: 60 days or more	£50 or 20% of rental rate, whichever is the greater Less than 60 days but more than 28 days	50% of rental rate 28 days or less	100% of rental rate changeover day for weekly bookings is Friday for shorter bookings the changeover day is flexible Check in time is after 3 p.m. and checkout time is 10 a.m. A security deposit of £300 is required. The deposit is fully refundable within seven days of departure provided the following provisions are met: •	No damage is done to the property or its contents, beyond normal wear and tear •	No charges are incurred due to illegal activity or collection of rents or services rendered during the stay •	All debris and rubbish is placed in rubbish bin, and soiled dishes, cutlery and pans are placed in the dishwasher or washed •	No excessive cleaning of the premises is required. •	All keys are left on the kitchen table and the cottage is left locked •	All charges accrued during the stay are paid prior to departure •	No linens or towels are lost or damaged •	No early arrival or late departure •	The renter is not evicted by the owner (or representative of the owner) or local law enforcement. . Please make payments on line or via personal cheques or BACS transfer as per the instructions on the invoice and booking confirmation. The maximum number of guests is limited to 6 (six) persons. Children under two years old are not included in this number.Over occupancy renders this agreement null and void and the owner reserves the right to terminate the agreement forthwith and repossess. . It is your responsibility to take out adequate travel insurance and cover This property requires a 2(two) night minimum stay. Longer minimum stays may be required during holiday period. If a rental is taken for less than two days the guest will be charged the two night rate.